An external node classifier is an arbitrary script or application which can tell Puppet which classes a node should have. It can replace or work in concert with the node definitions in the main site manifest (site.pp). Depending on the external data sources you use in your infrastructure, building an external node classifier can be a valuable way to extend Puppet. In this multipart series we’ll create an ENC which uses SCCM for its information. 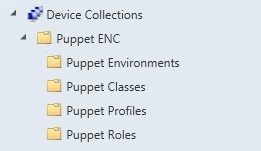 What are Puppet Roles and Profiles? How do we express this in SCCM? So all of this theory is nice but how do we actually put this into practice. Let’s use an example. A HTTP Load Balancer that reverse proxies connections to Web Servers. The Web Servers connect to a Database. System resources (Nodes) are members of Role collections. Direct or query based membership could be used. It should noted that there’s no concept of unique membership in SCCM, so it is possible that a Node could have two roles. Instead of restricting this in SCCM, we can push this check to the ENC code. SCCM has some good powershell integration so let’s use powershell to create the collections and memberships. This script lacks idempotency, but it gets the job done. The environment-role-profile-class hierarchy is specified in a single text blob, represented via JSON and then converted into a Powershell Custom Object. This makes it easy to read and modify the hierarchy as need. You can use different techniques (hashtables, CSV files) but this is a method that I prefer. "01/01/2000 $((Get-Random -Min 0 -Max 23).ToString('00')):$((Get-Random -Min 0 -Max 59).ToString('00')):00"
The collections are created with a daily refresh schedule. This helper function just generates a random time of the day and is used later on during collection creation. Write-Host "Creating collection $CollectionName ..."
The script will now create all of the required collections e.g. For each Profile, extract the class names and generate a unique list of classes. Write-Host "Adding $Role to $PupProfile"
Write-Host "Adding $PupProfile to $ClassName"
What does SCCM look like now? In Part 2, we’ll create a simple web service to query SCCM Database, and generate the required YAML for a Puppet ENC.